My Home and Garden: A full day in the sun and the garden. It was glorious. Lots of sun. And warmth. Allan set up the deck umbrella and we washed off a couple of chairs. I was actually hot working in the yard, so I did take a few breaks in between the working. Had a visit with neighbor Judy. I spread out a bag of alpaca manure to dry it off. I want to spread it in the flower bed which is full of flowers, so I need it lighter and less...clumpy. The last bag is going in the raised bed in the greenhouse. That is where the tomatoes and peppers will be going. 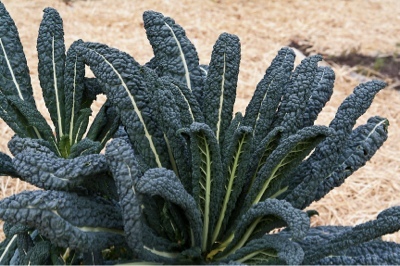 Seeded Cavolo Nero kale. I keep hearing about this kale and how delicious it is. A real treasure. I can't wait to try it. I love the curly kale in salad. It is awesome. My salads are now more than half kale. So that photo is not of YOUR Cavolo Nero then, Erin? I hope you will enjoy it in due course. It is quite unlike the curly types of Kale. More like spinach (if you remove the leaf-ribs). Lots of recipes for it on my blog...!